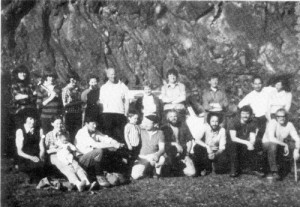 A society field trip to Nant-yr-Eira mine, Hafren Forest, Powys, Wales in May 1974. The Society was born out of an evening class on the 27th October 1972 when approximately thirty people, all from the area in and around Leicester, met to inaugurate The Russell Society. Early leadership and direction was provided by Dr Bob King of the Department of Geology, University of Leicester, who was President from 1973 – 1975, and who sadly died in 2013. 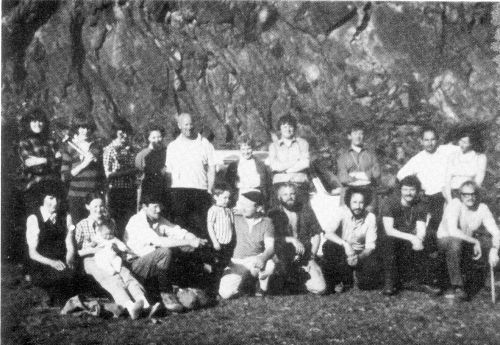 The tenth anniversary of the Society in 1982 was marked by the publication of a Special Photographic Record. The publication of the first Journal of the Russell Society was also in 1982, which put the Society on the map at a national level, and the formation of other branches began. Download a copy of the booklet in PDF format here. The twentieth anniversary in 1992 saw the establishment of the Russell Medal as an international award for outstanding services to mineralogy. The medal is awarded on an occasional basis to individuals, judged by the Council of the Society to have given outstanding service in the field of mineralogy. The first recipient of the medal was Dr. R.J. King and in the words of the President at the time, Dr. R.F. Symes ” there really could be no finer recipient in the first year of this award.” Bob King was a protegé of Sir Arthur Russell and the founder of The Russell Society. The 40th anniversary (corundum, variety ruby) of the Society in 2012 was marked by the creation of a Russell Reflections CD with photographs evoking nostalgic memories of the many aspects of The Russell Society with images of members, collecting and collections, sites and supporters, mineral finds and losses, friends, fun and laughter. You can download the Russell Reflections PDF document (size is 17 MB) from this link to Dropbox here.